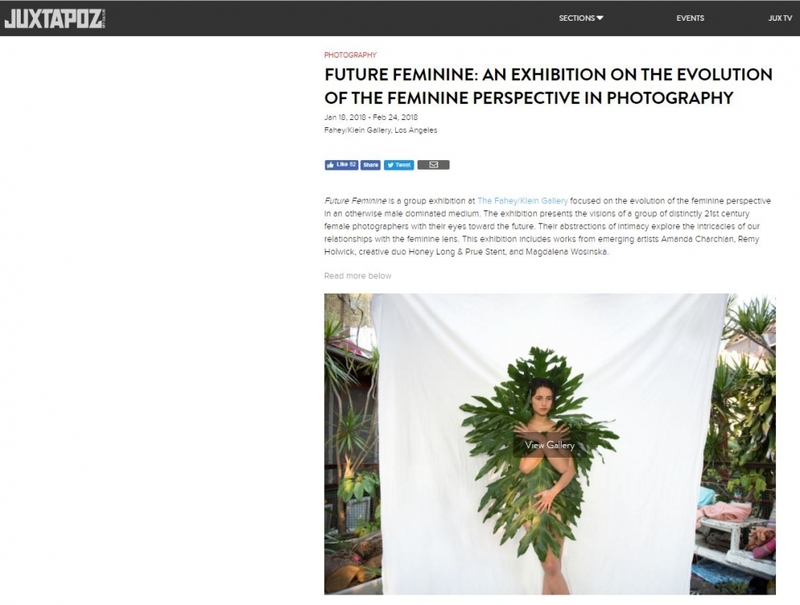 Future Feminine is a group exhibition at The Fahey/Klein Gallery focused on the evolution of the feminine perspective in an otherwise male dominated medium. The exhibition presents the visions of a group of distinctly 21st century female photographers with their eyes toward the future. Their abstractions of intimacy explore the intricacies of our relationships with the feminine lens. This exhibition includes works from emerging artists Amanda Charchian, Remy Holwick, creative duo Honey Long & Prue Stent, and Magdalena Wosinska. Amanda Charchian creates work with a feminine sensuality that celebrates the erotically charged. Amanda earned a BFA from Otis College of Art and Design in 2010, and has been featured in publications such as New York Magazine, Vogue Italia, TIME, The Huffington Post, Interview Magazine, L’Officiel ART, i-D, Purple, and Turkish Vogue. In 2016 Charchian released her first monograph, Pheromone Hotbox featuring works captured over three years. Charchian has produced editorial and commercial work for Gucci, Chloe, Cartier, Garage, and Vogue Italia. Amanda Charchian lives and works between Los Angeles and London. Remy Holwick works exclusively in analog photography, blurring the disciplines of documentary and fashion photography. Holwick’s experience as a longtime fashion model and feminist activist informs her work, often exploring themes of sexuality, power, and emotional manipulation in femininity, feminism, and femininization. Remy’s work has been featured in publications such as Purple, Let’s Panic, S Magazine, and Paper Magazine. Remy Holwick lives and works between New York and Los Angeles. Creative partners, Honey Long and Prue Stent are multidisciplinary artists whose work co-mingles photography, performance, installation and sculpture. Their process centers around their conflicted relationship to femininity and its passive associations. A fascination with alluring objects and materials is often incorporated in costumes or disguises intended to distort and fragment the bodily form. Honey Long and Prue Stent live and work between Sydney and Melbourne, Australia. Magdalena Wosinska prefers to shoot with ambient light, producing work most easily identified by her tough yet sunny California aesthetic. Since 2010 Magdalena has published three books, including Bite It You Scum, The Grass is Electric, and The Experience Vol 1. Magdalena’s fourth book, Leftovers of Love is due to be published in Spring of 2018. Magdalena lives and works in Los Angeles, CA.